The Pancake House - Milkhead 100mLWe heard you like some Milkhead in your pancakes, so that's exactl.. The Pancake House - Pumpkin Spice 100mLThrow some basic spooky spices, cursed hearty pumpkins, and o.. 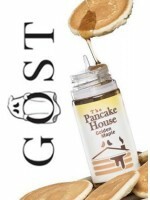 The Pancake House - Raspberry Hotcakes 100mLButtermilk pancakes smothered in freshly picked ras..
Gost Vapor Nic Salt - Menthol 30mLA polar blast of flavor that punches you with menthol and mint.Ava..
Gost Vapor Nic Salt - Lemon Cream 30mLA deliciously whipped combination of tarty lemons and smooth s..
Gost Vapor Nic Salt - Sweets 30mLA blend of peach and pineapples create the perfect setting for this..
Gost Vapor Nic Salt - Tobacco 30mLTobacco.Available in 59mg nicotine strengths in 30mL bottles.Gost .. The Pancake House - Golden Maple 100mLThe Pancake House Golden Maple is a simplified breakfast flavo.. The Pancake House - Banana Nuts 100mLThe Pancake House Banana Nuts is the perfect infusion between t.. The Pancake House - Glazed Strawberry 100mLThe Pancake House Glazed Strawberry is a phenomenal morni.. The Pancake House - Blueberry Flapjacks 100mLThe Pancake House Blueberry Flapjacks is a sensational ..